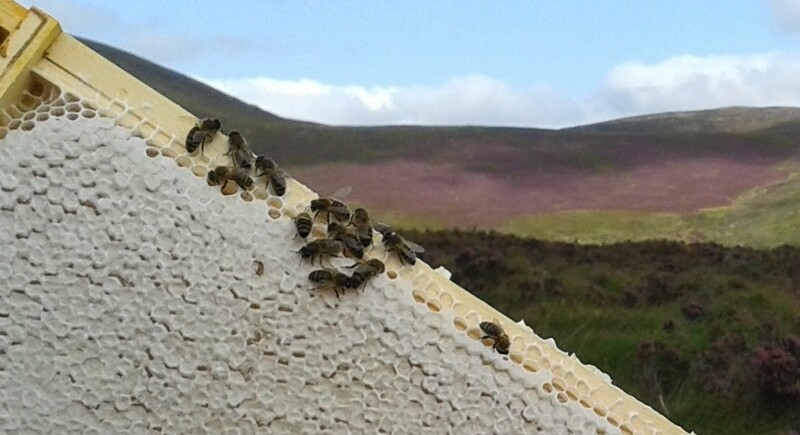 In this part of the world – July is the time to get the bees to the heather – if the flow is early you’ll miss it. But before you do that – have you got a heather site? Ling heather (Calluna vulgaris) honey is out there on its own for flavour and character. It is rich, reddish amber in colour with a musky flavour; open the jar and the scent of the hills will fill the room. Turn the jar upside down and it won’t budge – this is because it is thixotropic – in other words it forms a viscous gel and will not flow which means it cannot be spun out of the frames like other honeys but has to be pressed from the comb or sold in the comb either as sections or cut-comb. If, like me, you have placed your Apidea/s in a spot that overheats in very hot weather you can easily cool them down and stop them from absconding by draping a white flannel or a strip of pale towelling over them like an Arab headdress. The pale colour will reflect a lot of the heat and if you periodically drench the cloth with cold water the problem is solved. Alternatively you could just put a big sponge on the roof and wet it at intervals. Make sure there is a slope is away from the entrance or water will run in. Also, make sure that you have the ventilation grille partially open so the bees can circulate the air. If you fully open the door you will fully close the grille so avoid that – see the photo above.